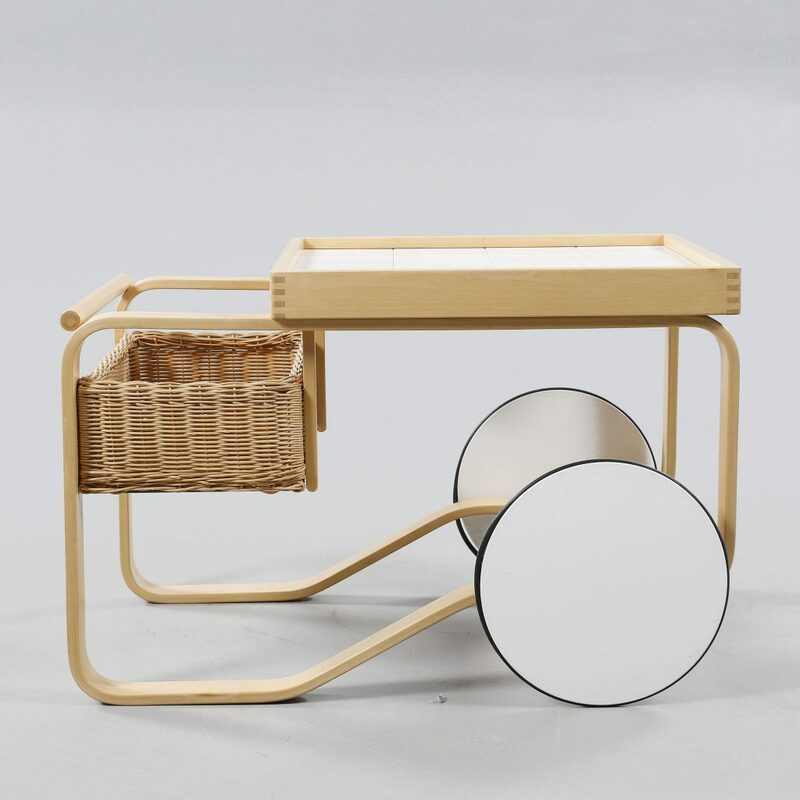 Find of the Week - Serving Trolley by Alvar Aalto | What is it worth? Carrying the signature attribute of Aalto designs, this serving trolley is currently on auction at Bukowskis Gothenburg, with a current bid of approximately € 834, already over its estimate. Creating light and elegant, yet sturdy frames, Alvar Aalto used bent birch plywood in many of his famous designs, including this trolley from 1937. Renowned with his humanistic and highly functional designs, Aalto added large white wheels with black rubber tread, which protects the floors. The organic material of rattan adds to the warmth of the design, while the white ceramic tiles increase the ease of use. Versatile in function, this trolley can be used for serving tea or drinks, as a side table or even as a platform for the kids’ LEGO collection. The present lot is far from a vintage piece. Produced by Artek in 2000, it has only minor wear, yet it is going to sell for under € 1000, while a new one goes for about $4,000, which makes this new example of a timeless design quite a catch. Introduced at the 1937 Paris World’s Fair, this model is in the permanent collection of many prestigious museums such as MoMA New York. A pioneer of the international modernist movement, Aalto is respected as one of the most talented and influential architects and designers of the 20th century. His humanist modernism and unique dialogue with nature, design and human being has become a living legacy.